Who's ready for Spring ?? Are you craving color but unsure which ones are really YOU?? your home drenched in all the same colors year after year? For many homeowners, adding new colors to their home, is difficult. More importantly, most homeowners are unsure what colors and patterns would compliment their homes and design tastes and grow weary from the vast amount of choices we have now to select from. Fortunately there is an easier and simpler way to change things up, without throwing it out. As a Certified Staging & Design Expert, I have helped hundreds of clients make changes in their homes everyday. 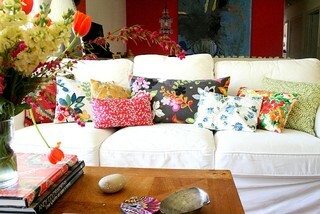 to introduce new colors and patterns, is through the use of accessories like pillows, throws, and even artwork. Once you have embraced new color choices, you can grow to add various patterns based on those color choices, and finally once your fear of color is erased, you can move onto repainting walls and more. By tackling your fear of color in small steps, you can grow yourself and your home into a Blooming bouquet of color and pattern, that is a Signature Style, that you can call HOME.